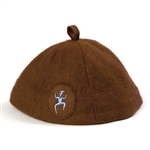 Brownie apparel and accessories to finish off any Brownie's wardrobe. Official Brownie Vest worn to display official pins, insignia and earned badges Official Brownie Sash worn to display official pins, insignia and earned badges Smart polo with side slits at hem. Slightly shaped. Cotton/polyester pique knit. Imported. 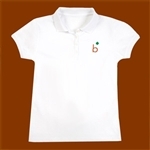 Complete your Brownie's outfit with this classic uniform shirt! This woven shirt has contrasting brown stitching and custom Girl Scout Brownie buttons. Girl Scout Brownie elf logo on left sleeve. Straight hem. Light. blue. 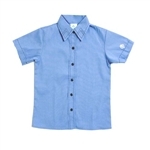 Fabric content – 65% Cotton; 35% Polyester Broadcloth. Imported. 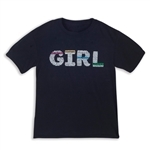 Available in Girl Sizes and Girl Plus Sizes. Go-Getter. Innovator. Risk-Taker. Leader. Show off your Girl Scout G.I.R.L. pride! You just LOVE, LOVE, LOVE Girl Scout cookies, so why not say it?—three times! 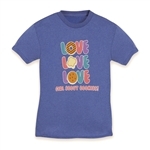 Multi-color “LOVE” screenprint on front with three different varieties of Girl Scout Cookies. Stands out in this medium blue heather with rib-knit crew neck and short sleeves. Slightly fitted. Cotton. Imported. 100% polyester felt Girl Scout Brownie uniform neck tie. Back snap adjusts size. Single snap front closure. Tie reads Girl Scout Brownie. Cotton. Imported.